504 Main by Holly Lefevre: It's an Anniversary Celebration! The past year with The DIY Club has been fun, creative, and crazy all at the same time. As one of the original founding members, aka Official DIY Gals, I can tell you that there is a lot of behind-the-scenes work that goes into The DIY Club. It is an honor and a privilege to work with my fellow DIY Gals, collaborate with talented DIY Club Resident and Dare Bloggers, and be inspired by all of the amazing DIY Club Members who link up every month at The DIY Club Project Party Monthly Contest. 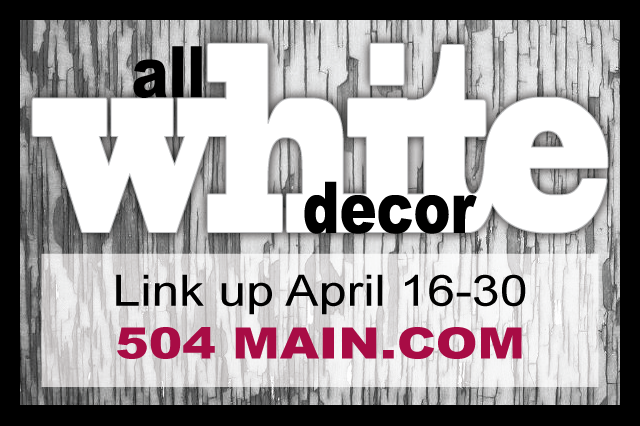 The party at 504 Main is going to be all about white! I love color, but white is fresh and summery and I am injecting more white into my casa right now! But, hold on...it does NOT have to be only decor...jewelry, sewing projects, cupcakes - you name it...if it is white - or a shade of white (yes, I count light gray and ivory and even light taupes) as white for my party (I am easy!). Grab my WHITE button at the bottom of the post! and maybe a surprise from me! 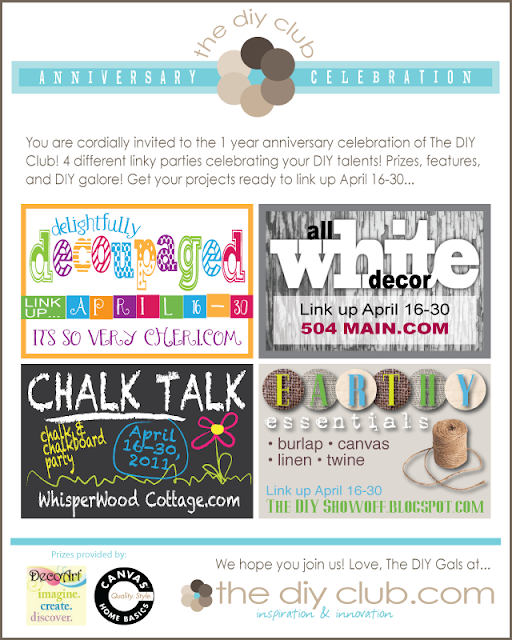 Get your decoupage, white, earthy, and chalkboard projects ready and we'll see you at all 4 parties starting April 16! So, will you celebrate with us? RSVP by leaving a comment below or on THE DIY CLUB event Facebook page. You can alss RSVP on the WHITE Party Facebook page. Would love it if all of you would include the button on your sidebar as well! Please invite your friends on FB and Twitter. It is a party, after all! The more the merrier!! I've been in a creative lull, lately. Ironically, I think it may be due to all the white we've had around here (the snow that just won't melt). Your party sounds like fun, though, so I'll see if I can get the creative juices flowing again. Partey! I have to look for a white post now. I posted your button onmy sidebar. Have a great day. This sounds so fun Holly!! I'm glad you said it could be something other than decor. . I was stumped there. But maybe I can come up with something else - I'm looking forward to seeing all the projects!! Congratulations on the 1 year anniversary of DIY! This sounds like a fun party! Woo hoo! Holly, Congratulations to you and all the DIY gals! It's been a very inspiring and creative year! I'm hoping to have some crafts ready to participate in those parties!